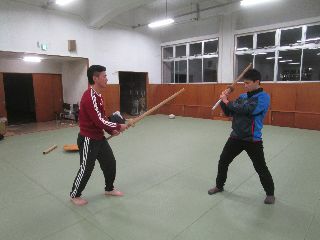 Dialogue with My Body: Samurai cannot do warm-up exercises! Samurai cannot do warm-up exercises! Therefore, it is important to have “a body that can move whenever you need”. Wild animals can run rapidly when they are attacked or find game without warm-up exercises. Because their movements are natural and in accordance with the structure of their body, they cannot have a pulled muscle even if they move roughly all of a sudden. If you cannot move without warm-up exercises, it means you move incorrectly to the structure of your body. This is a common principle on martial arts, yoga, and sports as well. When I noticed this fact at my high school age, I belonged to a soccer club. I did “rough” practices to make my body able to move whenever I want. For example, I went to a ground early morning and repeated dashes on a steep slope or did a shoot training without any stretching or warm-up exercises. I cannot recommend you to do these training because these are somewhat dangerous to be injured. However, I had a strange confidence not to be injured on those days. “Yogi should keep one-fourth of their stomach empty. They satisfy half of their stomach with food, satisfy one-fourth with water, and keep one-fourth empty so that air can move. This sentence may be mainly for health of digestive system, but I think, by my experience, it includes the intension to keep your body able to move. In fact, if you eat too much, you cannot move actively nor practice yoga for a few hours. I sometimes experience this state. If you eat too much, you cannot control your mind by practicing yoga even if you are aware to the state of your mind. If you eat less, it becomes rare that your mind is disturbed and you can control your mind by practicing yoga even if your mind is disturbed. In modern age, we seldom have a chance to be attacked by enemies like samurai, but, even, I think we should be ready to move whenever we need.